Claudiha-Gayatri Matussek is an overtone-singer. She lives in Munich, Germany, studied the ancient vedic knowledge with Sri Kaleshwar since 1998. Claudiha-Gayatri works as healer and as voice-artist and -teacher with overtones. 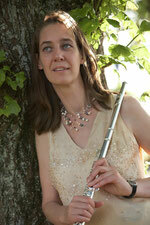 www.fluegel-der-stimme.de, "wings of voice ©"
Antonia Dorner, lives and teaches flute and breath in Munich, Germany. She studies and works with Claudiha-Gayatri since 2010. Singing the Hanuman-Chalisa or just listening to it connects us with "Pure Consciousness" and "Prana", the life-force within the air. The mind becomes quiet, free and open. Hanuman carries Sita and Rama in his heart: He stands for balancing the Divine Female and Divine Male Energy. As the one who is able to command the element air he can transform and bring solution to any problem. "Mastering the air-element brings happiness", said Sri Kaleshwar.